Notes: Rowton Castle, near Shrewsbury, Shropshire, England, is a Grade II listed country house that was once the home of the Royal Normal College for the Blind before it moved to its present location in Hereford. This 17th Century Castle is surrounded by 17 acres of gardens, approximately 6 miles away from Shrewsbury. Since bought It is currently used as a wedding venue, hotel and restaurant. 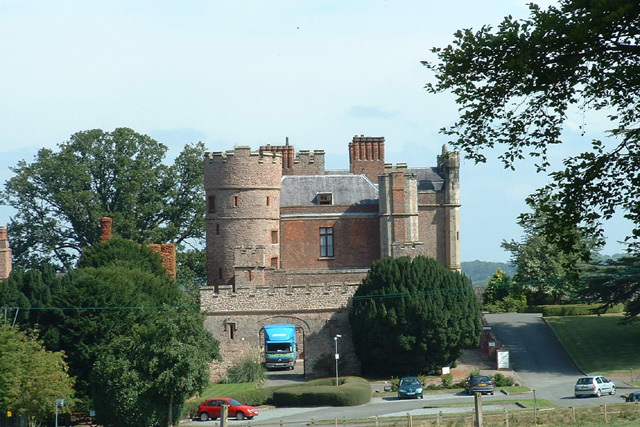 The present castle was built in the 17th Century, although a previous castle named Rowton Castle had stood on the site for several hundred years previously. The house was in the possession of the Lyster family until the death of the final person to bear that name, Lady Charlotte Lyster, in 1889. She passed the house to her nephew, Montagu Lowry Corry, who in turn passed it on to his nephew, Colonel N. A. Lowry Curry following his death in 1903. The house's next owner, Major Lees, sold it to the Royal Normal College for the Blind in 1941. The college, which had previously been located in London, was forced to find new premises after its site, based in Upper Norwood, was bombed during the Blitz, then acquired by the authorities. The college used the castle itself as the accommodation block for staff and senior pupils. The building also housed the dining areas for both junior and senior pupils. Classrooms, which have since been converted into private apartments, were built to the eastern side of the building. In 1953 a fire destroyed much of the buildings and 38 pianos and organs. The alarm was raised by one of the students, and everybody present was evacuated to safety. Training was able to continue after Henshaw's Institution for the Blind took students and staff as a temporary measure. As the college expanded it outgrew the site and bought other premises in and around Shrewsbury, then in 1978 relocated to Hereford after finding accommodation that would enable it to consolidate its facilities into one campus. After the college's departure the building was empty for several years until work began to convert it into a luxury hotel in 1986. The Castle was first opened as a hotel on 12 April 1989, and was acquired by its current owners in October 1977.